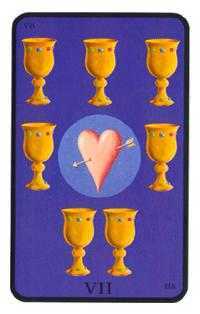 Among your many options, choose the one closest to your heart. 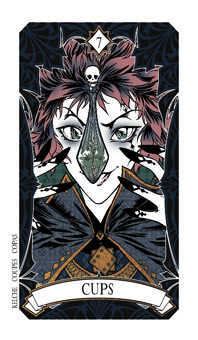 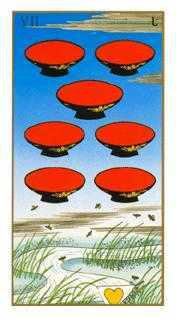 Omegaland deck © U.S. Games Systems, Inc. 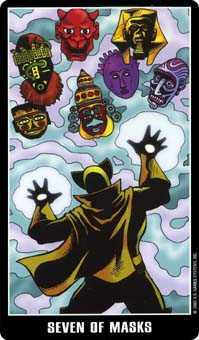 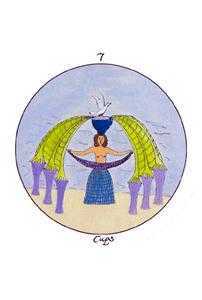 The Seven of this suit typically refers to works of the imagination, the use of dream and vision to invent a future different than the life one is currently living. 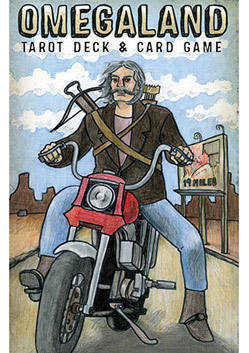 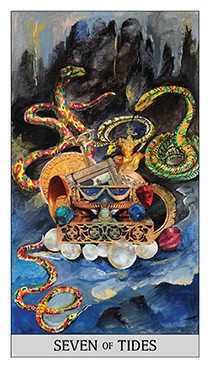 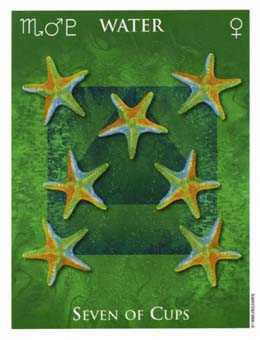 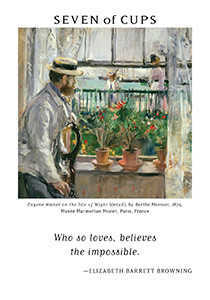 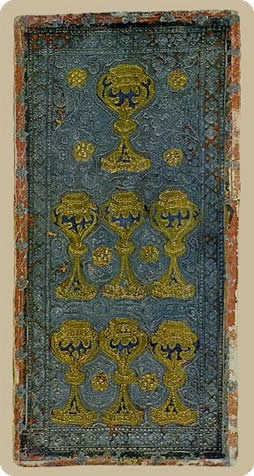 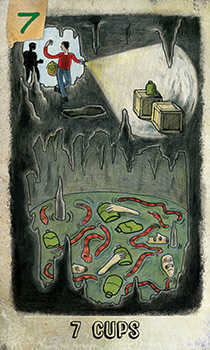 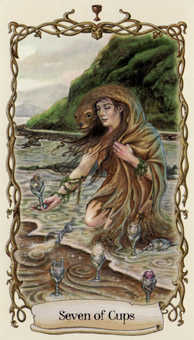 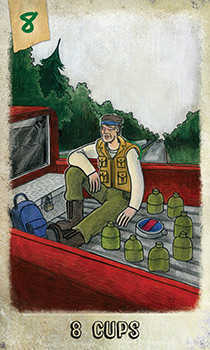 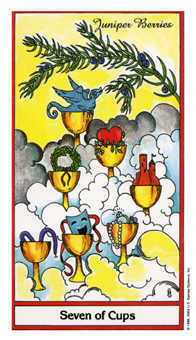 This card reminds us that our outcomes are not set in stone. 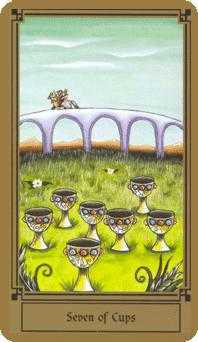 We can raise our hopes and expectations and upgrade our results. 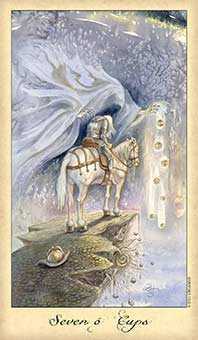 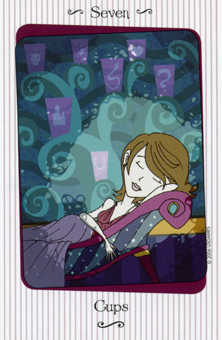 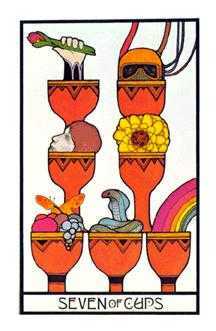 Do not be fooled by the title Fantasy which this card is sometimes given -- this card indicates the truly magical quality of awakened imagination. 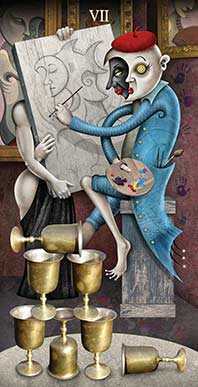 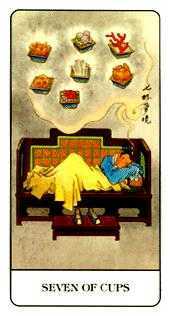 Allow yourself to daydream, for dreams give you creative ideas and solutions and produce wonderful results. 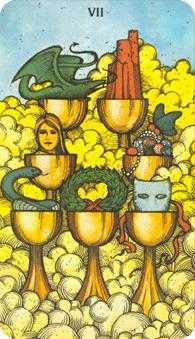 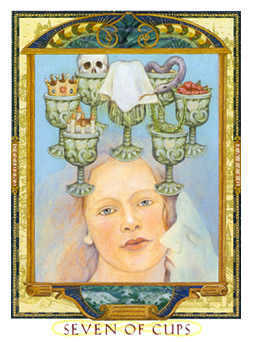 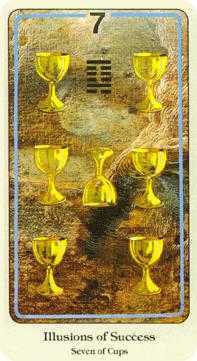 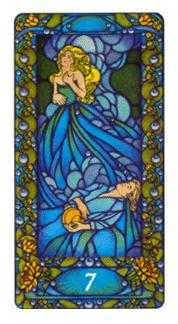 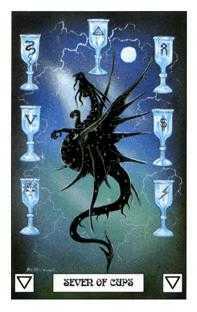 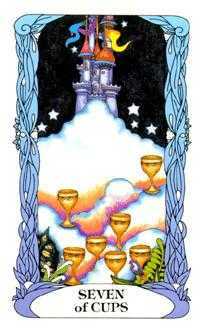 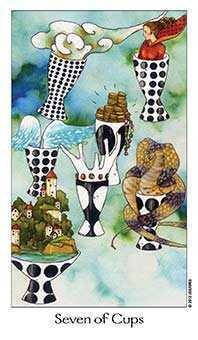 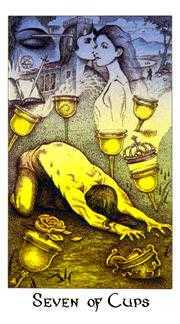 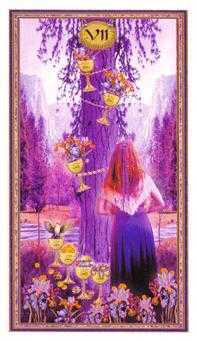 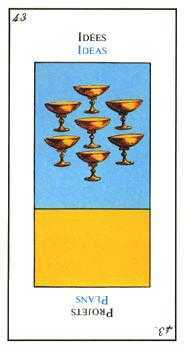 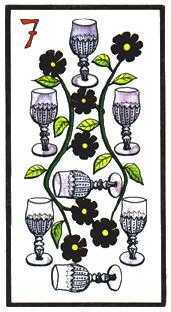 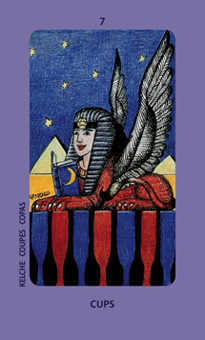 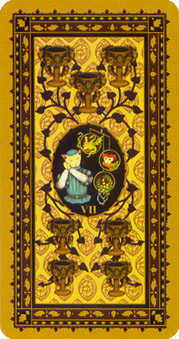 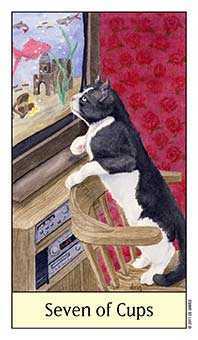 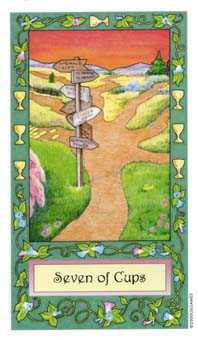 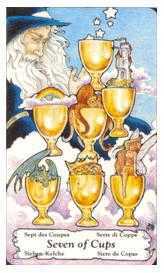 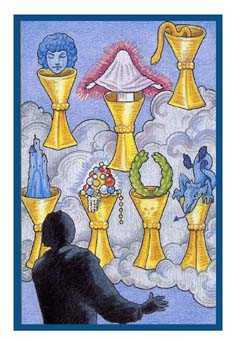 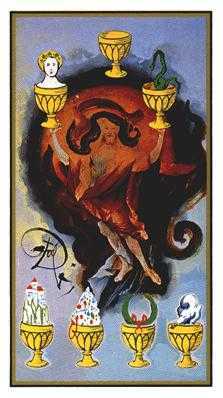 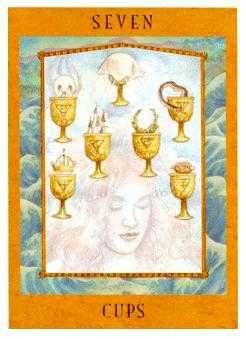 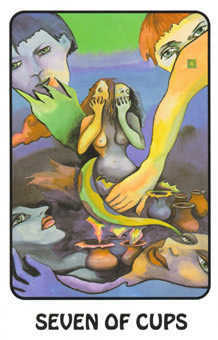 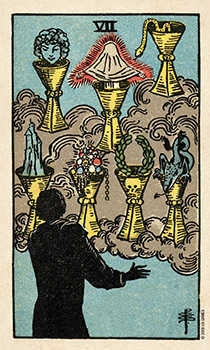 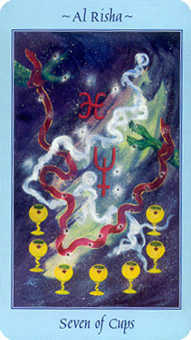 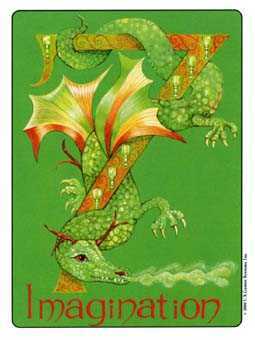 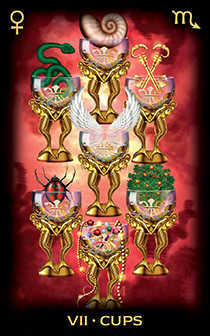 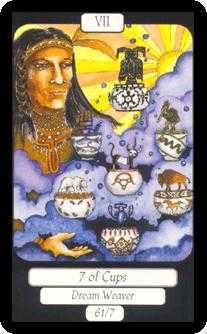 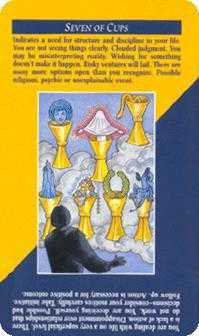 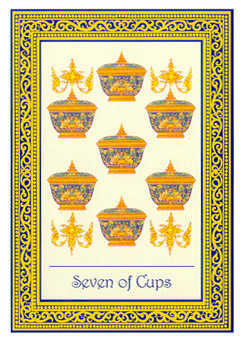 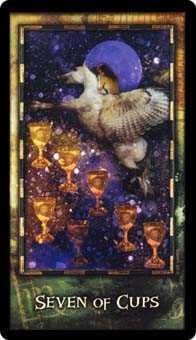 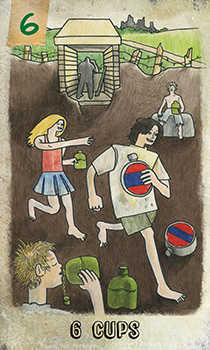 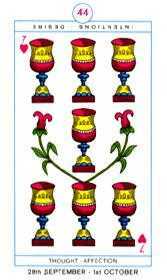 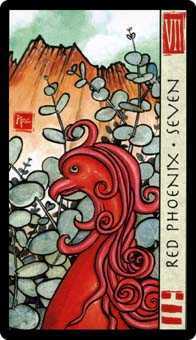 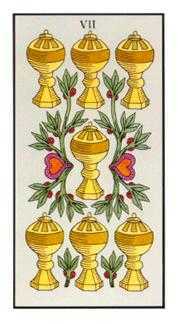 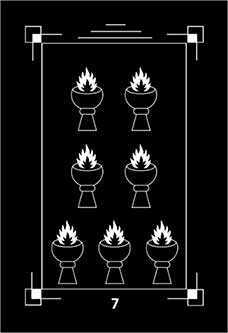 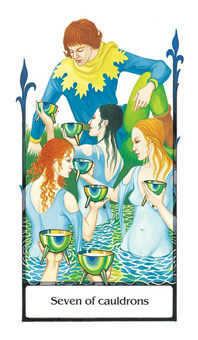 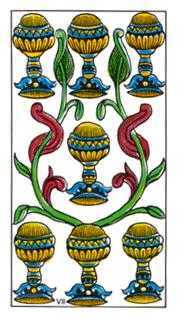 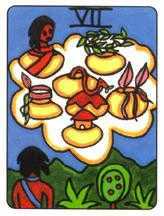 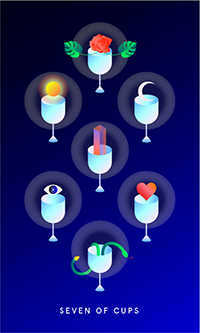 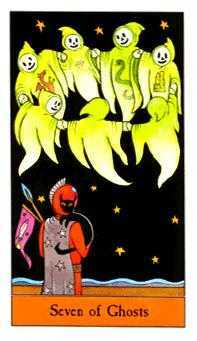 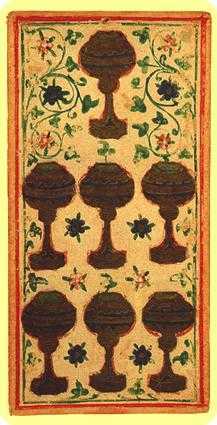 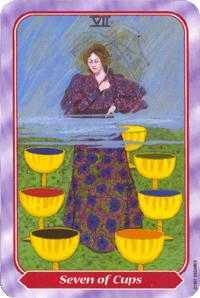 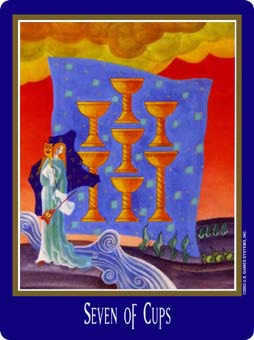 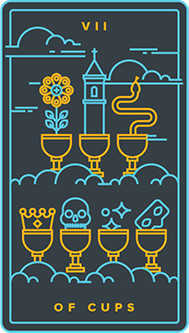 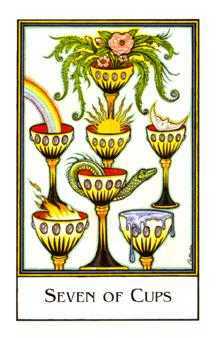 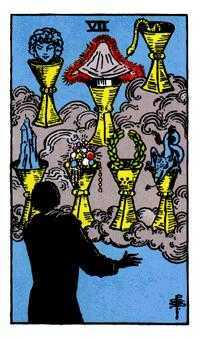 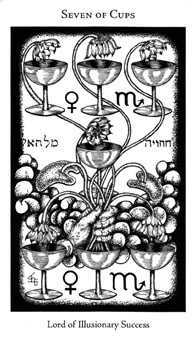 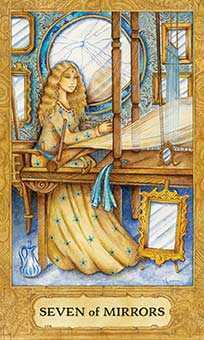 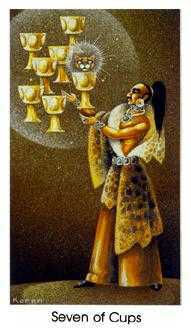 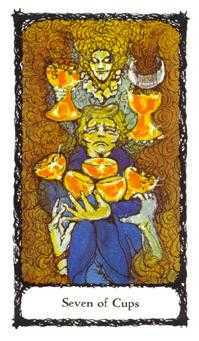 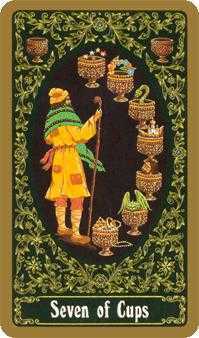 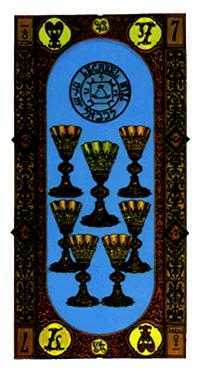 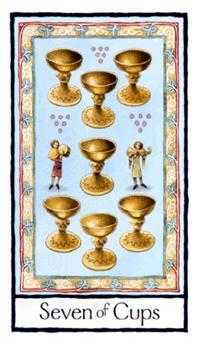 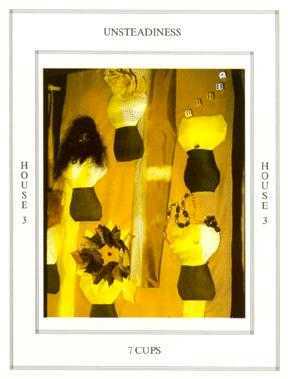 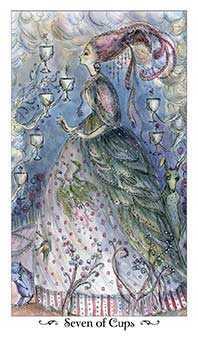 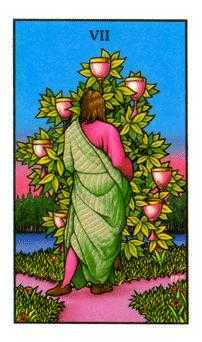 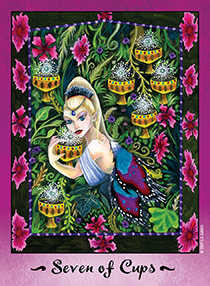 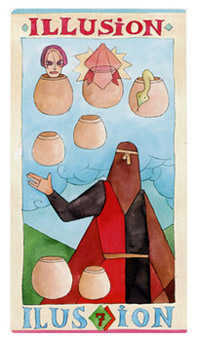 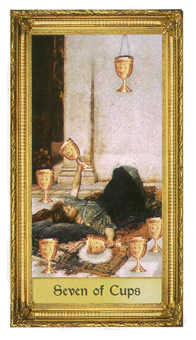 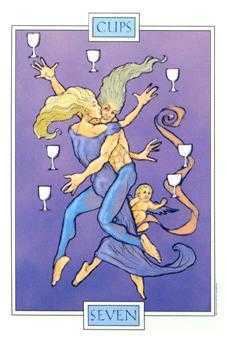 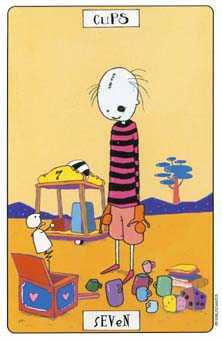 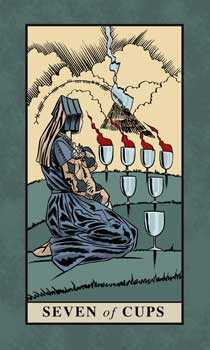 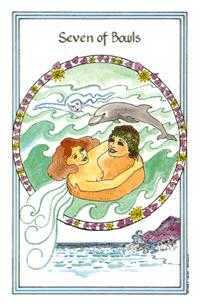 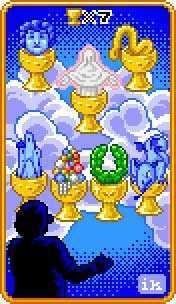 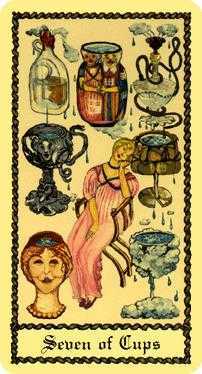 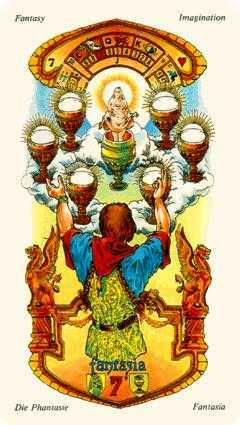 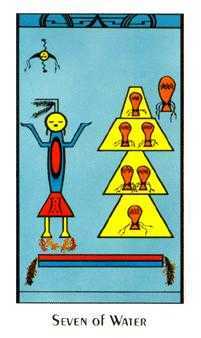 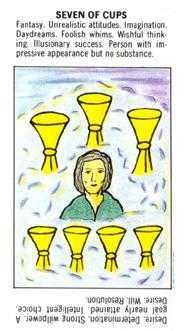 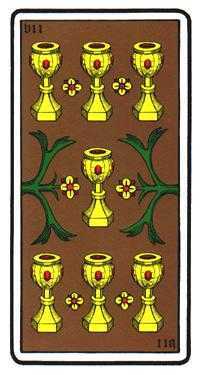 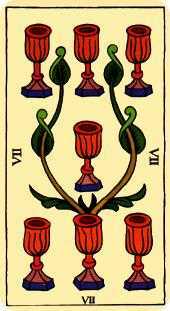 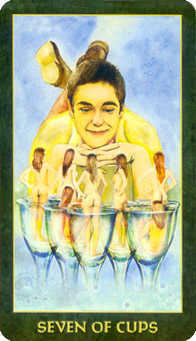 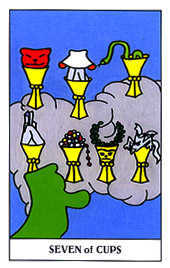 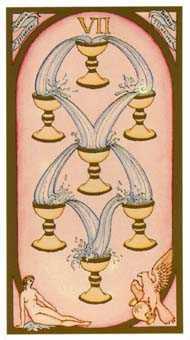 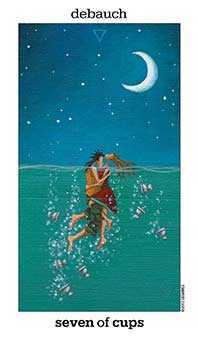 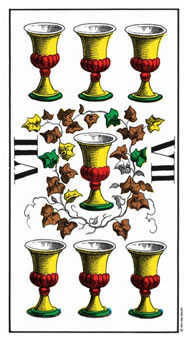 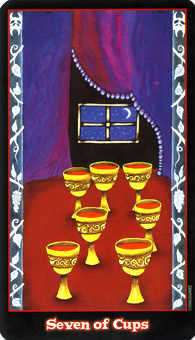 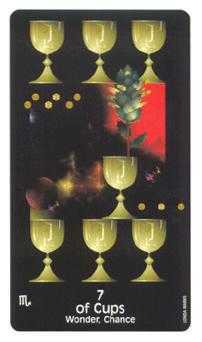 The Seven of Cups in this position advises that you relax your mind and open to the dreams and imaginings your inner child loves to entertain. 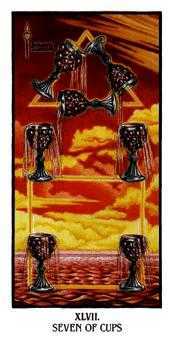 Allow yourself to imagine a truly positive outcome for this situation. 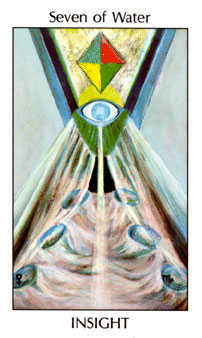 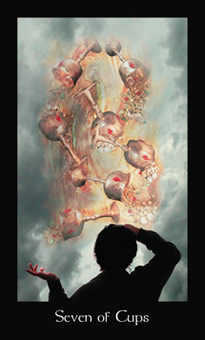 Perform an exercise in creative visualization by relaxing your guard and letting go of your fears. 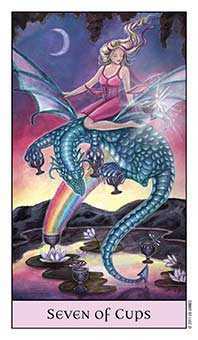 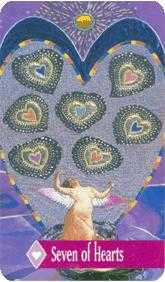 As the dreamscape unfolds, your electro-magnetic chemistry is stimulated to a point of achieving greater confidence in yourself and in what you are doing. 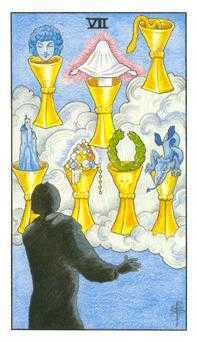 Even if it's only a temporary break from your fears, this is a helpful exercise because it gives your psyche and body a dose of unlimited thinking and optimism. 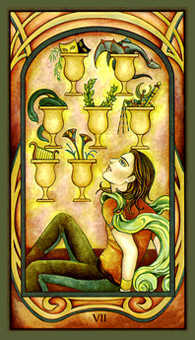 Think positively -- the results could truly be amazing.